Home » Furniture » Sculptured oak chair with velvet pillow. XVI century. XVI century. 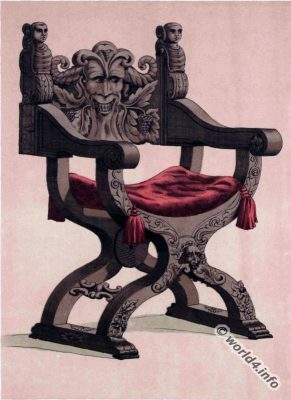 Sculptured oak chair with velvet pillow. Europe. Siglio XVI. Silla de roble esculturado, con almohada de terciopelo. From the book: Galería del Arte Decorativo: Enciclopedia Universal de Trajes, Armas, Muebles, Arquitectura, Útiles Domésticos y Ornamentación de Todos los Tiempos. Editor: J. Aleu Fugarull, Barcelona 1824. Previous PostAntique Table Decoration. Giant seashell 17th century. Next PostBrass door knocker. Italian foundry work.